In one of his sharpest attacks yet on Narendra Modi, former prime minister Manmohan Singh said his successor’s rule has not been good for India as he “failed” the electorate and led a government that was “mostly silent” on incidents of communal violence, mob lynching and cow vigilantism. Singh, while speaking at the launch of Congress leader Shashi Tharoor’s new book, alleged under the present dispensation the environment in universities and national institutions like the CBI was being vitiated and dissent stifled. His remarks came amid the current crisis in the CBI, whose top two bosses were divested of their powers and sent on leave by the government. In a scathing criticism of Modi, Singh said he was elected as the 14th prime minister of India on the back of many lofty promises, but in the past four years, he and his government “failed” their electorate and eroded the voters’ faith. He said Modi is a “paradoxical prime minister” and Tharoor has demonstrated this through his “superbly written and devastatingly accurate book”. Tharoor’s book is titled The Paradoxical Prime Minister: Narendra Modi and His India. “He (Modi) has spoken of being a prime minister for all Indians but the government he presides over has been mostly silent in the face of widespread communal violence, mob lynching and cow vigilantism. “At the same time, academic freedoms are being sought to be curbed. The environment in our universities and national institutions like the CBI is being vitiated and dissent stifled,” Singh alleged. “A new government has to reinvent a Federal Bureau of Investigation or a Central Bureau of Investigation. This cannot be repaired. This cannot be put together again. You can say the same thing about the Central Information Commission. You can say the same thing about the Central Election Commission,” Chidambaram alleged. Singh, in his speech, also came down hard on the government’s economic policies, saying nothing concrete had been done to bring back the “promised billions of dollars” allegedly held abroad as black money. The “hastily-implemented” demonetisation and GST have proved to be “disastrous” for the economy, the former prime minister said. Petrol and diesel prices are at a “historic high” despite the fall in international crude oil prices because the Modi government chose to levy excessive excise duties instead of passing the benefits of low prices to the people of India, he said, adding that Modi, instead, has thought it fit to “punish our people”. Singh also alleged that Modi presides over a “fearful population, an economy that has been set back by foolhardy initiatives, painful lack of jobs, the growing distress among India’s farming communities, a devastating number of farmer suicides, insecure borders, instability in Kashmir, and the palpable failure in implementation of even laudable initiatives like Swachh Bharat, Skill Development, Make in India and Beti Bachao, Beti Padhao”. “This is what he presides over, and not a secular, plural, free and equal society that was… envisioned and built in its six and a half decades as a free nation,” he added. Modi’s rule has “not been good” for India and it all arises from the Modi paradox that Tharoor has shown in his book, he said. “Much of what the Modi government is all about has turned out to be little more than a series of empty gestures…with very little substance having been achieved on the ground,” he said. 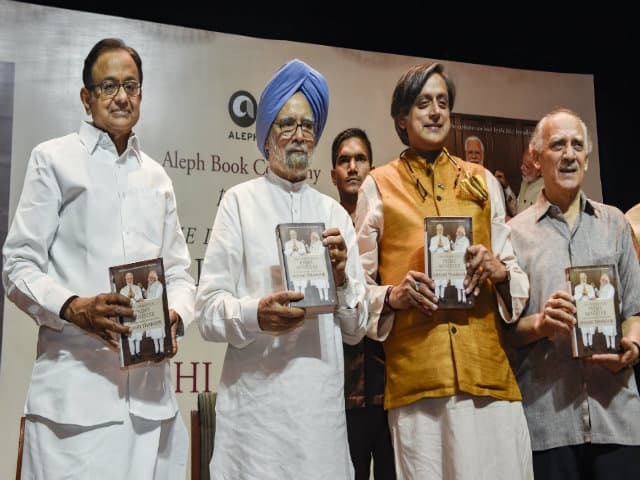 Singh lauded Tharoor for coming out with the “timely book, reminding us that the idea of India is under threat today from those who seek not just to rule India but to change India’s very heart and soul”. Earlier, speaking at the event, Tharoor alleged, “The government of India statistics will tell you that of all the cow vigilantism, cow-related violence that has ever occurred in independent India in 70 years, 97 per cent has occurred in the rule of Narendra Modi.” Tharoor, however, did not say which statistics of the government he was referring to and did not elaborate on his claim. During the panel discussion, Chidambaram, while referring to National Security Advisor Ajit Doval’s lecture here on Thursday, alleged that the talk of a strong state and hard decisions, was nothing but the seed of an “illiberal democracy”. Janata Dal (United) leader Pawan Verma, during the discussion, slammed the opposition , saying that it had no leadership. “Can we have an opposition which goes beyond photo ops?” he asked. “If everything about Modi is wrong, and we are six months away from an election. Why does he continue to enjoy personal popularity ratings which are so high?” he asked. Something must be wrong with those who are trying to oppose him or he must be doing some things better than the opposition, he argued. Former Union minister Arun Shourie and journalist-turned-politician Ashutosh also slammed the government for its policies.